In Ljubljana, Slovenia, last month ENP members met up for four productive and enjoyable days of ENP work and training. 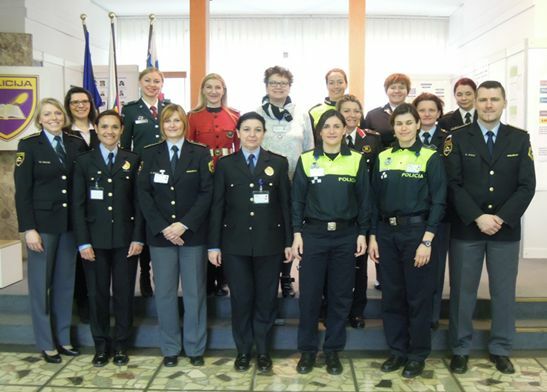 An ENP meeting was held to coincide with a Social Skills course organised by the Slovenian Police Academy; network members as well as employees of police organisations were invited to attend. There was a good turnout for the GB meeting held Monday 14. Amongst matters covered was the IAWP 2016 Training Conference to be held in Barcelona from October 9 to 13 in collaboration with our Network. The enthusiastic discussion of the subject resulted in a number of useful ideas and suggestions being put forward. There were also offers from those present to collaborate with preparations for the event, in particular, help in sourcing speakers. That evening ENP members and course participants had the opportunity to get know each other over a dinner attended by the Deputy Director General Police, Ms Tatjana Bobnar and the Director of the Police Academy, Daniel Zibret. The 25-hour Social Skills course was held over the following 3 days. Five motivated and motivating trainers offered informative interactive sessions, giving participants the opportunity to share experiences and knowledge whilst acquiring useful skills. Topic covered included Coaching and Leadership and Intervention Psychological Assistance. The ENP is very grateful to the Slovenian Police Academy for hosting these events and contributing to the friendly and collaborative atmosphere experienced by participants during their time in Slovenia.